The CSAT had become qualifying from 2015, and so many were relaxed about it. That could be a mistake in case you took it very lightly. Overall, CSAT was not an easy paper. You had to be either very good at reading comprehension (Hindi or English, not only English), or at basic Maths and Reasoning. If you struggle with both, this paper would be a nightmare. There were again, no questions were asked on Decision Making. The distribution of questions across topics was –28 questions on Mathematics and Basic Numeracy, 27 questions on Reading Comprehension and 25 questions on Logical and Analytical Reasoning. While many questions in Maths and Basic Numeracy needed simple formula application or basic drawing out of the problem situation or simple logic, some were not straight. Same for Logical and Analytical Reasoning. One set of 5 questions was a sitter, and must have been cracked to score high. Some sets were not easy. The Reading Comprehension questions (mirror copy in English and Hindi) were excellent! Overall 27 questions spread over 17 passages (all small size). But many options were tricky, especially in the “implied” questions. The CSAT paper 2016 was of a high quality if you look at the Reading Comprehension questions. This year, the RC passages were very clearly focused on three themes – (1) Ecology and environment (including agriculture and food related issues), (2) Governance and its problems (reflecting the approach of the present government), and (3) Cleanliness, Issues of Justice etc. There were 17 passages in all – 13 with single questions and 4 with more than one question each. The quality of these passages was very good, and each question forced one to think carefully. However, the task was made very easy by the options. Unlike some questions in Paper I – GS, the options here in CSAT were not too closely placed. That made deciphering the right answer easy. We think this is a good approach, as it makes even a qualifying paper worth preparing for. It is no cakewalk at all. The UPSC wants to impress upon the students the need to be very aware of these pressing issues which are defining the national discourse. Overall, some practice is indeed required for the CSAT. You cannot just assume you’ll breeze through it without any preparation. Read the following eight passages and answer the items that follow the passages. Your answer to these items should be based on the passages only. 1. Which among the following is the most logical corollary to the above passage? Sol. Ans (c) Theme : Crony capitalism and governance issues - In the passage, the first line “By killing transparency .......” clearly indicates that greater transparency in the functioning of the government is needed. India is a growing economy, and crony capitalism can harm rapid economic growth. A “corollary” is a proposition that follows from a proven one. Hence option (c) is correct. 2. What is the most logical and rational inference that can be made from the above passage? Sol. Ans (d) Theme : Climate adaptation and development concerns - Only option (d) sounds sensible, complete and not extreme. Option (a) is wrong. Option (b) is not mentioned anywhere. Option (c) is wrong. Hence option (d) is correct. 3. Which among the following is the most critical inference that can be made from the above passage ? Sol. Ans (a) Theme : Biodiversity and hydrology - Passage says “water and biodiversity are interdependent”. Options (c) and (d) are not wrong, but they are not related to the question. Option (b) is an extreme one. Hence option (a) is correct, and is the best critical inference drawn. 4. Which one of the following is the message that is essentially implied in the above passage? Sol. Ans (d) Theme : Banking sector and automation - The last line of passage “Today there is a need for a new ........ that does not exclude the common man” implies that need to promote “financial inclusion”. Also, the passage speaks of existing products serving the upper middle and middle classes. Hence, (d) is the best answer. Sol. Ans (b) Theme : Sanitation and manual scavenging - Obviously statement 1 is wrong as nothing is guaranteed regarding “fully solved”. Statement 2 is obviously implied in the passage. Hence option (b) is correct. 6. Which among the following is the most logical and rational inference that can be made from the above passage ? Sol. Ans (d) Theme : Man’s nature and appropriate government - Option (a) is not mentioned anywhere even indirectly. Option (b) is not correct as individuals may be short of fulfiling their own wants, but society may be able to (that is why people come together in a society). Option (c) is an obvious truth. But it may be true for other animals also. Option (d) is the best inference. Sol. Ans (b) Theme : Politics and economics in a society - Structure of legal systems in a society depend on what people demand over time. Demands depend on the manner of distribution of economic power in the society. State controls the society. So, the relationship of politics (State) and economics is being studied. Best answer is (b). The passage is not making out any one of these are dominant over the other. About 15 percent of global greenhouse gas emissions come from agricultural practices. This includes nitrous oxide fertilizers; methane from livestock, rice production, and manure storage; and carbon dioxide (CO2) from burning biomass, but this excludes CO2 emissions from soil management practices, savannah burning and deforestation. Foresty and use, and land-use change account for another percent of greenhouse gas emissions each ear, three quarters of which come from tropical deforestation. The remainder is largely from draining and burning tropical peatland. About the same amount of carbon is stored in the world's peatlands as is stored in the Amazon rainforest. 8. Which among the following is the most logical and rational inference that can be made from the above passage? Sol. Ans (b) Theme : Agriculture and greenhouse gas emissions - Option (a) being an extreme one, can be rejected. Option (b) is clearly spoken of. Option (c) is wrong. Best answer is (b). 9. 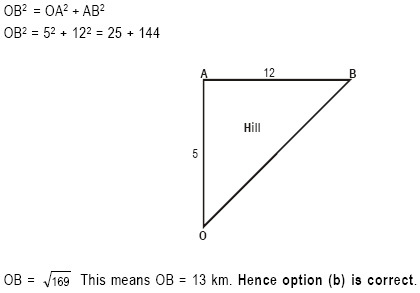 A person climbs a hill in a straight path from point 'O' on the ground in the direction of north-east and reaches a point 'A' after travelling a distance of 5 km. Then, from the point 'A' he moves to point 'B' in the direction of north-west. Let the distance AB be 12 km. 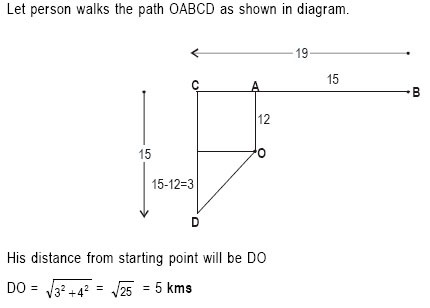 Now, how far is the person away from the starting point 'O'? 10. An agricultural field is in the form of a rectangle having length x1 meters and breadth x2 meters (x1 and x2 are variable). If x1 + x2 = 40 meters, then the area of the agricultural field will not exceed which one of the following values? Sol. Ans (a) Area of the field will be maximum when both sides of rectangle are equal. This is a basic mathematical theorem. “will not exceed” in the question means “what is the maximum possible”. Therefore x1 = x2 = 20 meters (because x1 + x2 = 40 is given). Max. Area = 20 × 20 = 400 sq. m.
CONGRATULATIONS! PT's IAS Academy had covered nearly all these questions in some form or the other in our CSAT preparation module. All reading comprehension passages were covered at length in the GS lectures, especially the ones on Environment and Ecology, Biomass, Agriculture and Food Security etc. The aptitude portion was covered at length separately. We are sure our students will crack this too. All the best for Mains! 11. 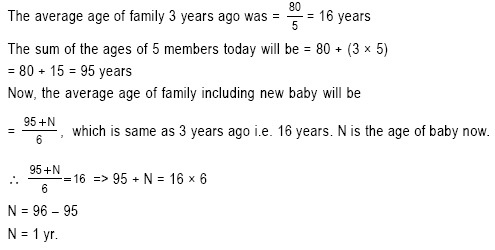 The sum of the ages of 5 members comprising a family, 3 years ago was 80 years. The average age of the family today is the same as it was 3 years ago, because of an addition of a baby during the intervening period. How old is the baby ? 13. A person is standing on the first step from the bottom of a ladder. If he has to climb 4 more steps to reach exactly the middle step, how many steps doe he ladder have? Sol. Ans (b) Person is standing on first step and middle step is 4 step ahead. Therefore middle step is the 5th step. Now top step will also be 4 step ahead of the middle step. Total no. of steps in the ladder = 9. 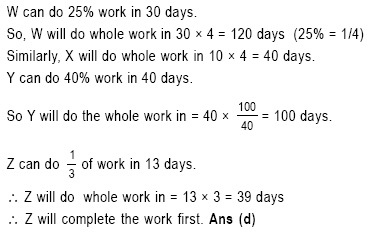 Direction for the following 3 (three) items: Consider the given information and answer the three items that follow. 14. What is C's surname ? 15. What is the colour of the tie ? 16. Who wore the sweater ? 18. A person walks 12 km due north, then 15 km due east, after that 19 km due west and then 15 km due south. How far is he from the starting point? 20. Ram and Shyam work on a job together for four days and complete 60% of it. Ram takes leave then and Shyam works for eight more days to complete the job. How long would Ram take to complete the entire job alone? Sol. Ans (d) In given code, first half of the word and second half of the word are reversed. FRACTION will be written as CARFNOIT. 22. If R and S are different integers both divisible by 5, then which of the following is not necessarily true? Sol. Ans (b) If R and S are multiple of 5, then R + S may or may not be divisible by 10. To solve such questions, always take actual values and check. For example, if R = 20 and S = 15. You will see that only (b) is correct. 23. How many numbers are there between 100 and 300 which either begin with or end with 2? 200, 201, 202, ..... 299 (Total 100) of which 10 end with 2 so subtract that. So final answer = 100 - 10 + 10 + 10 = 110. Hence, answer is (a). Remember either begin with or end with 2 means we cannot double count those that both begin with and end with 2. Otherwise answer will be 120 i.e. Option (d) none of the above. Read the following five passages and answer the items that follow the passages. Your answer to these items should be based on the passages only. As we look to 2050, when we will need to feed two billion more people, the question of which diet is best has taken on new urgency. The foods we choose to eat in the coming decades will have dramatic ramifications for the planet. Simply put, a diet that revolves around meat and dairy a way of eating that is on the rise throughout the developing. world, will take a greater toll on the world's resources than one that revolves around unrefined grains, nuts, fruits and vegetables. 24. What is the critical message conveyed by the above passage? Sol. Ans (a) Theme : Diet patterns in a heavily populated world - The passage is not about developing countries alone. It is about the fact that growth of population in developing countries and their choice of meat and milk as food will affect the entire world’s resources. Hence, options (c) and (d) are wrong. Option (b) speaks only about developing nations, hence ruled out. Best answer is option (a). It is the most critical message conveyed. 25. Which among the following is the most logical assumption that can be made from the above passage? Sol.Ans (b) Theme : Lactose tolerance in different societies - The passage speaks about the historical background of different societies in terms of their dependence on cattle and milk, and consequent genetic changes. Options (c) and (d) are very limited, hence ruled out. Option (a) is too direct, and not an assumption. Option (b) is the best answer. Sol. Ans (a) Theme : National output measurement and difficulties - All the options look correct here! Let’s analyse. Option (a) is not directly said, but is implied (suggested). So this is correct. Look at option (b). This is exactly what the author is trying to say. So this is not “implied” but stated directly. Option (a) is better than (b). Option (c) is a value judgement and can be ruled out. Option (d) is a strongly assumed statement, and can be avoided. The passage talks about conceptual difficulties in national income comparisons. Hence option (a) is the most implied answer. 27. Which among the following is the most logical corollary to the above passage? Sol. Ans (d) Theme : Delicate balance of carbon between atmosphere and soil - Option (b) is clearly wrong because of “solely responsible”. Various natural processes like volcanoes do so too. Option (c) is overlooking the interdependence of these factors. Option (a) is not wrong, but is a fact, not a corollary (a proposition that follows from one already proved). Option (d) is the best corollary. As green cover grows, more carbon trapped in soil will be released.Hence option (d) is correct. Historically, the biggest Challenge to world agriculture has been to achieve a balance between demand for and supply of food. At the level of individual countries, the demand-supply balance can be a critical issue for a closed economy, especially if it is a populous economy and its domestic agriculture is not growing sufficiently enough to ensure food supplies, on an enduring basis; it is not so much and not always, of a constraint for an open, and growing economy, which has adequate exchange surplues to buy food abroad. For the world as a whole, Supply-demand balance is always an inescapable prerequisite for warding off hunger and starvation. However, global availability of adequate supply does not necessarily mean that food would automatically move from countries of surplus to of deficit if the latter lack in purchasing power. The uneven distribution of Inoger, starvation, under or malnourishment, etc., at the world-level, thus owes itself to the presence of empty-pocket hungry mouths, overwhelmingly confined to the underdeveloped economies. Inasmuch as 'a two-square meal' is of elemental significance to basic human existence, the issue of worldwide supply` of food has been gaining significance, in recent times, both because the quantum and the composition of demand has been undergoing big changes, and because, in recent years, the capailities individual countries to generate uninterrupted chain of food supplies have come under strain. Food production, marketing and prices, especially price-affordability by the poor in the developing world, have become global issues that need global thinking and global solutions. 28. According to the above passage, which of, the following are the fundamental solutions for the world food security problem? Sol. Ans (b) Theme - Global food production, supply, demand & poverty -The passage does not talk about setting up more agro based industries. So statement 1 is wrong. Similarly, 4 is wrong as subsidies are not mentioned. So options (a), (c) and (d) are wrong. Best answer is option (b). Surely, the passage does mention that price affordability by poor, and marketing regulation is important. Sol. Ans (d) Theme - Global food production, supply, demand & poverty - Options (a) and (c) can be ruled out right away. Option (b) mentions a fact that is not a challenge to world agriculture, but to its management. Option (d) is the key idea. Hence option (d) is the correct answer. 30. According to the above passage, which of the following helps/help in reducing hunger and starvation in the developing economies ? Sol. Ans (c) Theme - Global food production, supply, demand & poverty - Statement 4 is not mentioned as a definite policy goal. So options (b) and (d) are eliminated. Both 1 and 3 are clearly stated. Hence option (c) is the correct answer. Sol. Ans (b) Theme - Global food production, supply, demand & poverty - Surprisingly, 1 and 2 both are not stated directly. Only statement 3 is relevant to passage. Hence option (b) is the correct answer. 1 cannot come at the first place. So 2, 3 and 4 can appear there. 4 cannot come at the last place. So 1, 2 and 3 can appear there. 2 and 3 cannot immediately follow each other. So 23 and 32 is not allowed. 1 cannot be immediately followed by 3. So 13 is not allowed. Hence, answer is (a). Total 6 numbers are possible. 33. A cylindrical overhead tank of radius 2 m and height 7 m is to be filled from an underground tank of size 5.5m x 4m x 6m. How much portion of the underground tank is still filled with water after filling the overhead tank completely? Sol. The number of girls is twice that of boys in a class of 60 students. Hence number of girls is 40 and boys is 20. Now, Kamal is seventeenth from the top. Therefore there are 16 students ahead of Kamal out of which 9 girls, and so 7 are boys (16 - 9 = 7). 35. A and B walk around a circular park. They start at 8 a.m. from the same point in the opposite directions. A and B walk at a speed of 2 rounds per hour and 3 rounds per hour respecely. 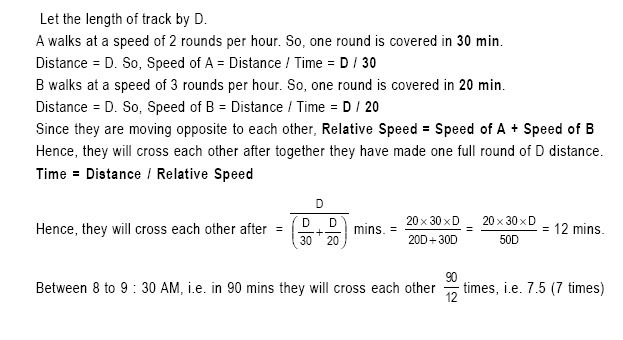 How many times shall they cross each other after 8 00 a.m. and before 9.30. a.m.? 36. W can do 25% of a work-in 30 days, X can do 1/4 of the work in 10 days, Y can do 40% of the work in 40 days and Z can do 1/3 of the work in 13 days. Who will complete the work first? 37. The average monthly income of a person in a certain family of 5 is Rs. 10,000. What will be the average monthly income of a person in the same family if the income of one person increased by Rs. 1,20,000 per year? If one person's income increases by Rs.1,20,000 per year, his/her monthly income increases by Rs.10,000. So, average monthly income now becomes 60/5 = Rs.12,000. 38. In a race, a competitor has to collect 6 apples which are kept in a straight line On a track and a bucket is placed at the beginning of the track which is a starting point. The condition is that the competitor can pick only one apple at a time, run back with it and drop it in the bucket. If he has to drop all the apples in the bucket, how much total distance he has to run if the bucket is 5 meters from the first apple and all other apples are placed 3 meters apart ? 39. A round archery target of diameter 1 m is marked with four scoring regions from the centre outwards as red, blue, yellow and white. The radius of the red band is 0.20 m. The width of all the remaining bands is equal. If archers throw arrows towards the target, what is the probability, that the arrows fall in the red region of the archery target? 40. A person allows 10% discount for cash payment from the marked price of a toy and still he makes a 10% gain. What is the cost price of the toy which is marked Rs. 770? Accountability, or the lack of it, in governance generally, and civil services, in particular, is a major factor underlying the deficiencies in governance and public administration. Designing an effective framework for accountability has been a key element of the reform agenda. A fundamental issue is whether civil services should be accountable to the political executive of the day or to society at large. In other words, how should internal and external accountability be reconciled? Internal accountability is sought to be achieved by internal performance monitoring, official supervision by bodies like the ---Central-Vigilance Commission-and-Comptroller and Auditor—General, and judicial review of executive decisions. Articles 311 and 312 of the Indian Constitution provide job security and safeguards to the civil services, especially the All India Services. The framers of the Constitution had envisaged that provision of these safeguards would result in a civil service that is not totally subservient to the political executive but will have the strength to function in larger public interest. The need to balance internal and external accountability is thus built into the Constitution. The issue is where to draw the line. Over the years, the emphasis seems to have tilted in favour of greater internal accountability of the civil services to the political leaders of the day who in turn are expected to be externally accountable to the society at large through the election process. This system for seeking accountability to Society has not worked out, and has led to several adverse consequences for governance. 41. According to the passage, which of the following factor/factors led to the adverse consequences for governance/public administration? Sol. Ans (c) Theme - Civil services and accountability issues - - Only option (d) sounds sensible, complete and not extreme. Option (a) is wrong. Option (b) is not mentioned anywhere. Option (c) is wrong. Hence option (d) is correct. Sol. Ans (d) Ans (d) Theme - Civil services and accountability issues - - Statement 1 is clearly wrong, and is not explicitly stated. In statement 2 - The civil services can be made accountable to the society by being accountable to the political executive which was accountable to the public/society, was stated in the passage. Now that mechanism has not worked out. It does not mean the political executive is not answerable to public. Hence neither 1 nor 2 is valid. Best answer is option (d). 43. Which one of the following is the essential message implied by this passage? Sol. Ans (c) Theme - Civil services and accountability issues - - The third option (c) is implied (indirectly hinted at)in the passage. Option (d) is clearly stated, not implied! Option (a) is a fact stated (not implied). Option (b) is not stated. Clearly, option (c) is the best answer. 44. According to the passage, which one of the following is not a means of enhancing internal accountability of civil services? Sol. Ans (a) Theme - Civil services and accountability issues - - You will be confused between options (d) and (a). Option (d) is mentioned at the end of the passage as a means of bringing decision-making closer to people, thereby enhancing accountability. But option (a) i.e. better job security and safeguards were put in place to ensure a sense of safety, thereby delinking civil services from political processes, and hence ensuring external accountability. Best answer is option (a). Sol. Ans (a) Theme - Religion, justice, communities, right & duties - - The last line makes Assumption 3 invalid. So all options are eliminated, except (a) which is the best answer. 46. Which one of the following is the crux of this passage? Sol. Ans (c) Theme - Religion, justice, communities, right & duties - Crux (main message) of this passage is "balance between rights and duties is crucial to the delivery of justice in a society." Best option is (c). B and C fell sick, and both of them ate oranges. So, it must be the oranges which made them sick. Correct answer is option (d). 48. Consider the following statements. Sol. Ans (d) It expresses the complete logic properly. Option (a) is wrong. Option (c) is wrong as per given statements. Option (b) is incomplete. Hence, option (d) is best. 49. A person X was driving in a place where all roads ran either north-south or east-west, forming a grid. Roads are at a distance of 1 km from each other in a parallel. He started at the intersection of two roads, drove 3 km north, 3 km west and 4 km south. Which further route could bring him back to his starting point, if the same route is not repeated? Sol. Ans (b) A simple diagram will help solve this. Since roads are either North-South or, East-West, it can be seen that person X can reach his original location by first travelling 3 km east and then 1 km north as given in option (b). "We shall go either for a picnic or for trekking". Sol. Ans (d) The statement meant that one of those two actions were bound to happen - either picnic, or trekking. Option (d) negates both. Options (a) and (c) are correct - do not falsify the claim. Option (b) is irrelevant. Hence, best answer is option (d). Sol. Ans (d) Question does not say anything about the gender composition of the group invited for party. Further, we do not know which specific female faculty knew music. So either all in party were males, or some males and some females who did not know music were present in the party. All options have some problem except (d) which is definitely correct. 52. Five people A, B, C, D and E are seated about a round table. Every chair is spaced equidistant from adjacent chairs. 53. There are five hobby clubs in a college —photography, yachting, chess, electronics and gardening. The gardening group meets every second day, the electronics group meets every third day, the chess group meets every fourth day, the yachting group meets every fifth day and the photography group meets every sixth day. How many times do all the five groups meet on the same day within 180 days? Sol. Ans (d) 5 hobby groups - photography, yachting, chess electronis and gardening. Gardening - Meets every second day hence = 90 times in 180 days. We have to find highest common factor of these 5 numbers 90, 60, 45, 36 and 30. It is 3. Hence option (d) is correct answer. Sol. 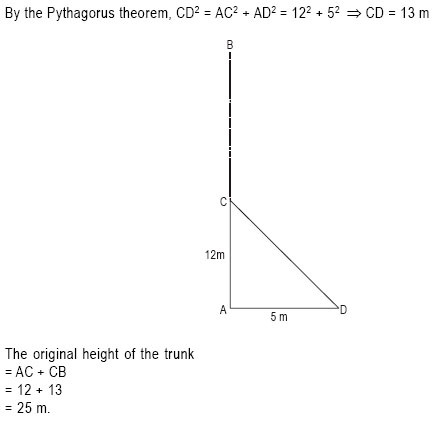 Ans (c) Just use the options and solve directly! Question based on simple logic. Option (c) satisfies the conditions. 55. Who is the doctor? This was the easiest 5 question set, which should have been solved by all. P and S are unmarried students (hence not professionals), T a married man (so there is a female in this group), Q is brother of P, R is not a doctor. Q is neither a doctor nor an artist, so he must be a lawyer. R must be an Artist, so T should be a doctor (because P and S are students). 56. Who is the artist? 57. Who is the spouse of R? 58. Who is the lawyer? 59. Who of the following is definitely a man? Q is the “brother” of P.
60. There is an order of 19000 quantity of a particular product from a customer. The firm produces 1000 quantity of that product per out of which 5% are unfit for sale. In how many days will the order be completed? Firm produces 1000 quantity per day of which 5% are unfit. So fit quantity = 1000 - 50 = 950 per day. So effectively the firm is producing 950 quantities / day. Hence, it would take 20 days to produce 19000 quantities. 61. What is/are the present constraint/constraints in using biomass as fuel for power generation? All the three constraints are mentioned in the passage. Hence, best answer is (d). 62. Which of the following can lead to food security problem? Sol. Ans (c) Theme - Biomass fuels and the evolving debate on emissions -The fifth line of first paragraph says "Energy crops compete with food production and have an impact on prices." Hence statement 3 is correct. Now look at the options. Options (a) is ruled out. Statement 2 speaks of using biomass for carbon capture and storage. Indeed, if this is used for emissions control, food security will be a problem. So option (c) is best. 63. In the context of using biomass, which of the following is/are the characteristic/characteristics of the sustainable production of biofuel? Sol. Ans (c) Theme - Biomass fuels and the evolving debate on emissions - Statement 1 is clearly wrong. So options (a) and (d) are eliminated. Statement 2 is correct. Within limits, biomass as a fuel does not disrupt food and forest resources. Statement 3 can be correct is those unproven nascent technologies work out. Hence best answer is (c). Sol. Ans (a) Assumption 1 is implicit in passage. Hence option (a) is correct. Assumption 2 is valid only if done improperly, not always. We are witnessing a dangerous dwindling of biodiversity in our food supply. The green revolution is a mixed blessing. Over time farmers have come to rely heavily on broadly adapted, high yield crops to the exclusion of varieties adapted to the local conditions. Monocropping vast fields with the same genetically uniform seeds helps boost yield and meet immediate hunger needs. Yet high-yield varieties are also genetically weaker crops that require expensive chemical fertilizers and toxic pesticides. In our focus on increasing the amount of food we produce today, we have accidentally put ourselves at risk for food shortages in future. 65. Which among the following is the most logical and critical inference that can be made from the above passage? "We are witnessing a dangerous dwindling of biodiversity in our food supply. The green revolution is a mixed blessing". Hence, the most logical and critical inference is option (d). Option (a) is not wrong, but that is a fact stated. Option (b) is also a fact. Option (c) may or may not be correct. Sol. Class starts at 11:00 am and lasts till 2:27 pm. 67. Four friends A, B, C and D need to cross a bridge. A maximum of two persons can cross it at a time. It is night and they just have one lamp. Persons that cross the bridge must carry the lamp to find the way. A pair must walk together at the speed of slower person. After crossing the bridge, the person having faster speed in the pair will return with the lamp each time to accompany another person in the group. Finally, the lamp has to be returned at the original place and the person who returns the lamp has to cross the bridge again without lamp. To cross the bridge, the time taken by them is as follows : A: 1 minute, B: 2 minutes, C: 7 minutes and D: 10 minutes. What is the total minimum time required by all the friends to cross the bridge? Sol. Minimum time would be achieved when the fastest person would be assigned to return the lamp, who in this case is A. So, Total minimum time will be 3 + 8 + 11 + 1 = 23 minutes. Ans (a). Hence vessel C is the sweetest, followed by vessels A and B. Hence, Ans (d). 69. In aid of charity, every student in a class contributes as many rupees as the number of students in that class. With the additional contribution of Rs. 2 by one student only, the total collection is Rs. 443. Then how many students are there in the class? Sol. Total collection = Rs 443. Every student contributed an amount equal to total number of students. Hence, N = 21. Hence Ans (b). Sol. Let every question carry 1 mark. So total number of marks is 70. Therefore passing marks = 60% of 70 = 42 marks. So, Anita's total marks = 7 + 12 +18 = 37 marks which is 5 short of 42. So 5 more marks are required to pass the exam. Hence Ans (b). 71. In a class, there are 18 very tall boys. If these constitute three-fourths of the boys and the total number of boys is two-thirds of the total number of students in the class, what is the number of girls in the class? Sol. Let the total number of male employees be M & that of female be F.
Percentage of males employed = 4F/5F *100 = 80 %. Ans (b). 74. Which one of the following boxes contains the golf ball? Sol. Ans (b) Given six boxes A, B, C, D, E and F. Colours are violet, indigo, blue, green, yellow and orange (not in order). Kept from left to right (not in same order). Six balls of cricket, hockey, tennis, gold, football and volleyball (not in same order). As per the given information, we can try and make either an elaborate grid, and place values one by one (values will be mostly ticks and crosses initially). Positions are 1,2,3,4,5,6 from L to R.
After a few iterations, we will arrive at the answers. Or else we can simply read through the questions and realize that it is not worth the effort as elimination may be possible. Make simple relations like these. Eliminate the known variables and you can easily find out that the Golf ball is in Box B. Also, Box F is painted indigo. And two possibilities remain for the colour of Box containing football, hence indeterminate. 75. Which of the following statements is/are correct? 76. The football is in the box of which colour? Sol. 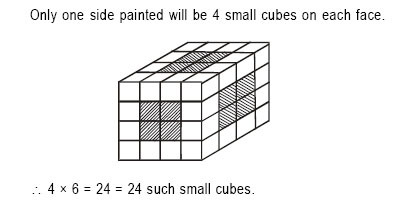 Ans (c) Given six boxes A, B, C, D, E and F. Colours are violet, indigo, blue, green, yellow and orange (not in order). 77. Two numbers X and Y are respectively 20% and 28% less than a third number Z. By what percentage is the number Y less than the number X ? Sol. Ans (b) Let third number Z be 100. Therefore X will be 80 & Y will be 72. 78. A daily train is to be introduced between station A and station B starting from each end at 6 AM and the journey is to be completed in 42 hours. What is the number of trains needed in order to maintain the Shuttle Service? Sol. Ans (c) Journey takes 42 hours (1 day and 18 hours). So a train starting at 6 AM from one end can take return journey on third day 6 AM from other end. Hence two trains each will required from each end is a dailyservice is required. Sol. Ans (d) We have to list the total number of cases which are distinct from each other. In all these cases, no two candidates have marked answers identically. View full Paper-II analysis (CSAT) session by Sandeep sir! View Scanned Prelims Paper-II here! Analysis Paper I - here!